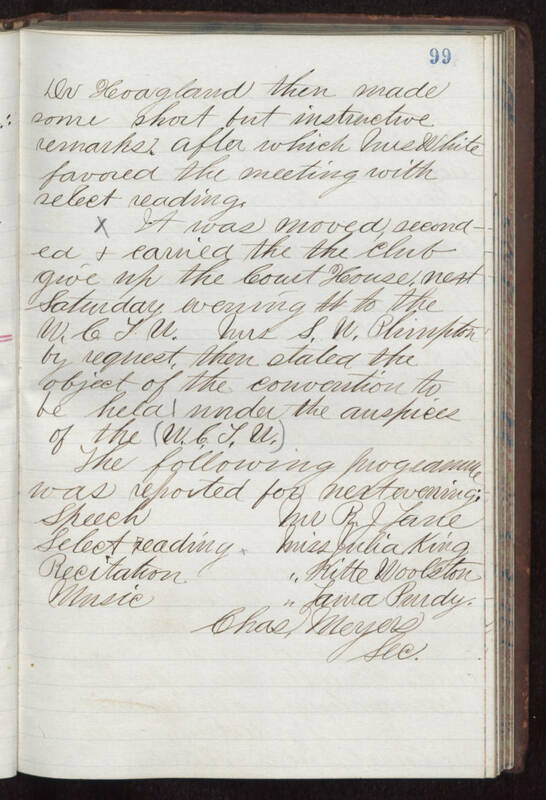 Dr Heoagland then made some short but instructive remarks after which Pres White favored the meeting with select reading. X It was moved, seconded + earned that the club give up the Court House, next Saturday evening to the W.C.T.U. Mrs S.W.Plimpton by request, then stated the object of the convention to be held under the auspices of the (W.C.T.U.) The following programme was reported for next meeting: Speech Mr. R. J. Lane Select Reading Miss Julia King Recitation " [Kitte?] Woolston Music " Lana Purdy Chas Meyers Sec.